APCaRI, represented by John Lewis and Catalina Vasquez, met with many Yukoners in Whitehorse recently to discuss the potential of including the North of 60 men in the registry and their samples in the biorepository. 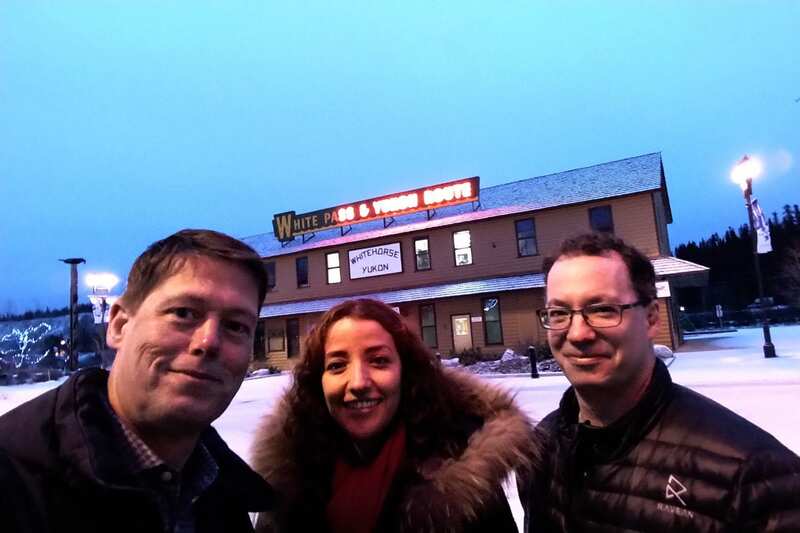 Sean Secord (photographed with John and Catalina), formerly with the Yukon Hospitals Foundation, talked with John on CBC Whitehorse radio about the challenges that Yukoners with cancer, and their families, have to manage and overcome to get testing and treatment. They are formidable; a recent article by Simkin et al., 2017 evaluated cancer mortality rates in the Yukon from 1999 to 2013 and found that they were elevated for prostate, female breast and lung, and colorectal cancers compared to both urban and rural populations in Canada South of the Yukon. The authors suggested that the high Yukon rates are, in part, due to the high percentage of Yukoners living in rural and very remote communities, making it necessary for patients to have to travel long distances for diagnoses and treatment. But even if the cancer patient lives in Whitehorse, (Yukon capital, population 25 085), cancer care options are limited due in part to a lack of oncologists and the specialized equipment needed. John and Catalina met and had stimulating discussions with many people dedicated to improving cancer care in the North including the Yukon Ride for Dad organizers, representatives from the medical and laboratory communities and people living with cancer, and their families. APCaRI is determined to find a way to include the Yukon men in the registry so that their valuable medical information and samples can be added to the prostate cancer research initiative and be an important part of improving prostate cancer diagnosis, treatment and care.